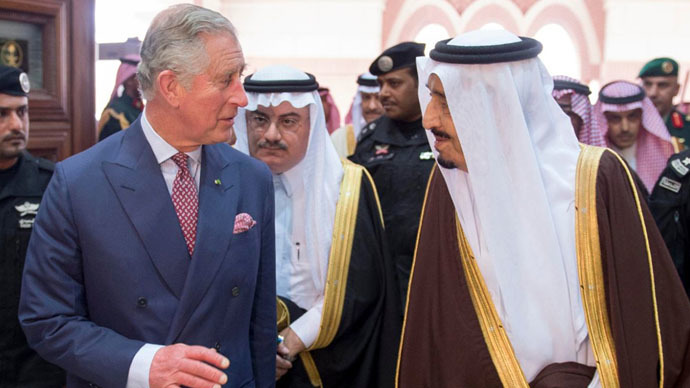 Britain’s Prince Charles has met with Saudi Arabia’s new King Salman and the new Crown Prince Muqrin on a tour of the Middle East – as he came under strong pressure to raise human rights concerns, including the flogging of blogger Raif Badawi. Badawi, 31, a Saudi activist and blogger, was sentenced to 10 years in prison and 1,000 lashes. He was also ordered to pay 1 million Saudi riyals (£160,000) for setting up the Saudi Arabian Free Liberals Forum. Human rights advocates have urged Prince Charles to bring up Badawi’s plight while visiting Saudi Arabia. King Salman, 79, is thought to be more conservative than his predecessor, his half-brother King Abdullah bin Abdulaziz, who died in January. “We still need the UK government to do more on Raif's case, but Charles's diplomatic intercession could help to secure this man's freedom,” she added. Simon Collis, British Ambassador to Saudi Arabia, also said the prince’s personal relationships with the Saudi royal family could make a difference. Collis added that he did not know whether Prince Charles would discuss Badawi or human rights issues at the meeting. Prince Charles and Prime Minister David Cameron were criticized last month after visiting Saudi Arabia to pay their respects following the death of 90-year-old King Abdullah. The decision to fly flags at half-mast at Westminster Abbey and other UK government buildings also drew criticism. Many in the British establishment hailed King Abdullah as a reformer who pushed for more women’s rights. Human rights groups, however, have described the late king as a tyrant who quashed democratic movements. Saudi Arabia executed at least 68 people between January and November 2014, according to Human Rights Watch. Four people were executed in less than a week of King Salman assuming power. She had been convicted of the sexual abuse and murder of her seven-year-old stepdaughter. In December, reports emerged of two women facing trial in a special court for terrorism after they broke the female driving ban. During his six-day Middle East tour, Prince Charles has already held bilateral talks with Jordan's King Abdullah and met with Christian refugees from Iraq at the British ambassador's residence in Amman.